INSPIRE, at North High School, is a personalized, proficiency-based learning environment available to all incoming Freshmen for the 2017-2018 school year. Students work in a collaborative setting with an integrated curriculum focused on real-world, project-based applications that will prepare students for the rigors of college and the workplace. INSPIRE shares the same values and hallways as the rest of Waukesha North, allowing students to take advantage of the elective and extracurricular opportunities that are a part of the high school experience. An emphasis on technology integration, student innovation, career pathways exploration, and community/professional experiences encourages students to set and realize their goals and dreams. With the support of your teacher/advisor, you will have choice in your schedule each week. Learning times will be controlled by your needs and interests, not bells and clocks. 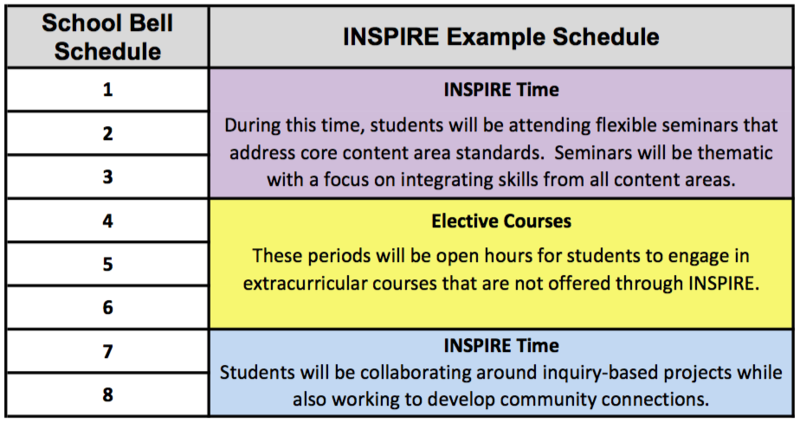 Your time in INSPIRE will allow you to progress through the core curriculum through seminars and small-group/independent learning opportunities. In addition, you will have 3 periods in which you will have the opportunity to select elective courses. What will the learning experience look like? What type of student will succeed in INSPIRE? What will an interdisciplinary project/unit look like? Each unit will have a major focus on the core skills of reading, writing, communication, math, and digital citizenship. Units will also have specific content requirements that will meet those that are required for graduation and beyond. These skill and content requirements will be aligned with those of the tradition classroom. English Literature - Students will read a choice book from a list that may include: 127 hours, Lord of the Flies, or Into the Wild and relate their experience to that of the characters in the book. They will gain insight on the struggles of these characters and document their struggles and successes in a personal "survival journal." Extracurriculars - Students will have the opportunity to creatively design their learning experience around their curriculum from their extracurricular courses. For example, students in a business marketing class may invent a new gadget specific to their wilderness survival needs or Family and Consumer Science might create a book on wilderness survival emergency food packs. Can I still be in AP (Advanced Placement) classes? Yes! 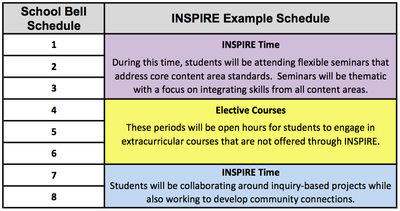 INSPIRE has been structured to support and challenge all students. As a result, you will be able to schedule yourself into AP classes. Will I be able to take elective classes (such as marching band and foreign language)? 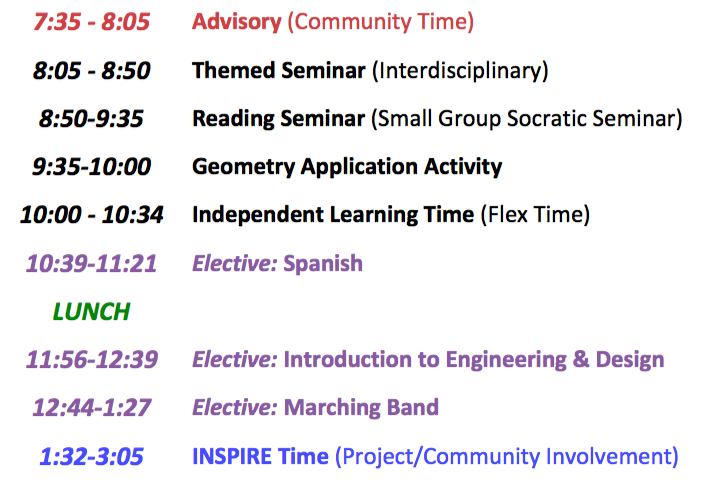 Students will have 3 hours of release time from the INSPIRE program during which they will have the opportunity to engage in elective courses outside of INSPIRE. At the same time, we will be providing you opportunities to personalize your elective experience within the flexible model of INSPIRE, allowing you to explore areas of interest. How will INSPIRE develop a community within the program? INSPIRE values the opportunity to develop a strong learning community in which students and teachers work to create a culture that epitomizes our STAR characteristics: Safety, Teamwork, Accountability, and Respect. A strong emphasis will be placed on the advisory/community-building times at the beginning of each day and the regular, 1-on-1 conferencing between teachers and students. The teachers and students, along with other school staff and parents, strive to be true partners in designing and supporting a strong learning environment. What is the service learning component of INSPIRE? INSPIRE emphasizes the responsibility of the individual to him/herself, the school community, and the broader community. We work to cultivate an environment that values community service and creating a positive impact on the world. As a result, students are expected to participate in community service experiences (earning 1 credit over the 4 years) throughout their time in INSPIRE to embody these values. Yes! In fact, if you demonstrate proficiency in the required competencies, you can even graduate early. How will credits look on my transcript? How will colleges view my INSPIRE courses when I'm applying for admission? Your credits and transcripts will look the same as students in the traditional environment. You will graduate with community/career experiences, a capstone project, and skills unique to this program, and we believe this will set you apart as an applicant. What happens if I realize that INSPIRE isn't the right fit for me? You will like it! ...but, if you don't, you will meet with your teacher/advisor and counselor to find the best course of action. How do I apply, and when will I know when I am in the program? The application process is online, and both parts (Part 1: Online Application and Part 2: Teacher Recommendation) are due on Monday, January 23, 2017 at 11:59 pm. We will let you know if you have been admitted by January 31. 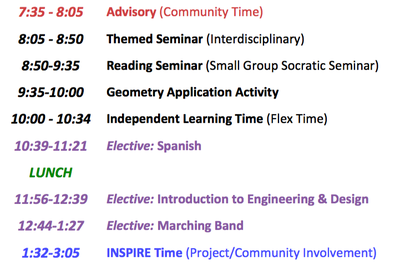 I am using the Open Enrollment/School Choice program to attend Waukesha North's INSPIRE. What paperwork do I need to complete? ​If you are not currently in the School District of Waukesha enrollment zone and you are chosen to be a member of INSPIRE, then you will need to complete the Open Enrollment (out-of-district) application during the enrollment window: February 6-April 28, 2017---Apply HERE. As a result, please prepare this paperwork after you apply for INSPIRE. We will let you know if you are in the program prior to the deadline; and, at that point, you can submit the required documents. Please feel free to e-mail us with questions at North_INSPIRE@waukesha.k12.wi.us or call the main office at (262)970-3500. We will be happy to connect with you via e-mail, phone, or in person to discuss the program in more detail.